As a group, I loved these characters! Not since The Raven Boys have I been so obsessed with a cast of characters. And while these characters as a whole don’t quite match up to The Raven Boys for me, they are a very close second and have so much potential. They work together as a team so well, even if they don’t always get along and there really wasn’t a weak link. And The Banter. I love it so much! Kaz Brekker. I love him. Like, I’m in love with him. It’s a problem. He has become one of my favorite characters of all time. He’s clever, strategic, sarcastic, vengeful, vulnerable, protective, selfish…there are just so many layers to him! I adore him. I just wanted More, More, More Kaz. I also loved the comic relief that Jesper and Wylan provided and I loved how resourceful Inej was. It took a little while for Nina and Matthias to grow on me, but they eventually did and I heart them, as well. I’m a big fan of Bardugo’s Grisha series, but it’s been awhile since I read it and I’ve forgotten how great of a writer she is. She’s amazing. And as much as I love her first series, I think I love this series even more, even if it’s just one book in so far. There was a lot of angst in the Grisha series and while there is some angst in this book, it’s not a main plot point. I loved the overall story and I especially loved the subtle twists and turns throughout. There were times I was sure something terrible was happening, then realized it was all part of the plan. I love when a book can surprise me and Six of Crows surprised me over and over again. Ok, so the romance was not a major part of the book. In fact, it was a pretty small part in the grand scheme of things, but it was well done and we got a little bit of everything. There’s the beginning of a cute flirtation. There are exes who will maybe reconcile (and were the main attraction for the angst in this book). And there are the friends who are trying to deny their feelings for each other. And yet another reason why I’m obsessed with Kaz – who doesn’t love a guy who will tear someone’s eye out of it’s socket for you!? I was thisclose to giving this book 5 stars, which if you know me, you know why that is such a big deal. But there were just a couple problems with it. For being a heist book, I thought it was just a little too slow paced. Now if all of the slower chapters were from Kaz’s point of view, I probably would have had no problem with it. But, that brings up my second point, I thought there were too many chapters from Matthias and Nina’s POVs. I could have used a little more Jesper and A LOT more Kaz. I was pretty happy with the amount of POVs we got from Inej, though I would’ve liked maybe one more small chapter from her at the end. 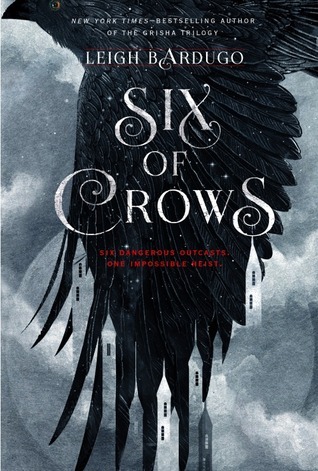 Overall, I just really loved Six of Crows. I loved the cast of characters, the twists and turns the story took, the romances, and KAZ BREKKER. Can I say that enough? I love Kaz! This is one book that definitely lives up to the hype and I strongly recommend it to basically everybody. Though it’s a YA book, it read adult. And while I think it would be helpful to read the Grisha series first (there are a few mentions of characters featured from that series and some of the events that took place), I think you could read it on it’s own and figure it out. So, go read this book! So glad to hear you enjoyed this one! I absolutely adore Kaz too; although, I think Inej is still my personal favorite. I don’t know, I can’t decide! I must reread this book soon. Nice review! Thanks! I loved it. Inej is probably my second or third favorite. Kaz Forever! A book you almost gave 5 stars – I have to read it. If you loved it that much it’s definitely worth trying! Really great review! Thanks! I hope you enjoy it as much as I did whenever you get to it! Happy Thanksgiving to you, as well! Yes the pacing and POV divisions could have been a little better, but it’s still an amazing book. And Kaz…I’m obsessed with him (obviously).